Versatile datalogger for most environmental or industrial datalogging. Fully sealed module with detachable wiring panel. 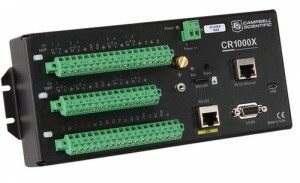 The CR1000X has an extended memory and directly connects to a computer's USB port or to an ethernet port. The CR1000X is a low-powered device designed to measure sensors, drive direct communication and telecommunications, analyse data, control external devices, and store data and programs in on-board, non-volatile storage. The electronics are RF-shielded and glitch-protected by a unique sealed, stainless-steel canister. A battery-backed clock assures accurate timekeeping. The on-board, BASIC-like programming language—common to all Campbell Scientific dataloggers—supports data processing and analysis routines. The CR1000X wiring panel includes two switchable 12 V terminals, analog grounds dispersed among 16 analog terminals, and unpluggable terminal blocks for quick deployment. Storage expansion of up to 8 GB with removable microSD flash memory card.